Awhile back, Giovanni posted the question, what if humans took a much care of their own genetics as they do dogs? And then recently, Al Fin made yet another post on dysgenic breeding trends and the lowering of global IQ. So, in the spirit of moving the debate forward I offer solutions for increasing children from more genetically fit parents and decreasing ones from those who aren’t. Create a project prevention on a larger scale. Offering them money, vouchers, or even booze would work effectively. If drugs were legalized, doubly so. People on the left side of the bell curve have extremely low executive function and very short future time orientation. Ultimately, I believe that such a program would have to have global reach. Every antibiotic resistant strain of disease in Africa, can just as easily pass through the borders of developed countries and infect the local population via immigration. First world nations have tools to detect the existence of these problems, 3rd world ones don’t and won’t for the foreseable future. Africa should be on top of the list, as in some cases they start as epidemics there and move with the migrants. Use TV as a propaganda tool. Excessive TV viewing tends to skew towards those on the left half of the bell curve of IQ and tend to be more violent. Obviously any preventative measure that gets people interested in things other than TV should be encouraged, however we should also coordinate social programs into TV programs. Overall TV has been shown to lower birthrates somewhat on it’s own, but the content method matters. Match the Sabido method, which has had some success in Mexico, and we’ll be off to a good start. The third method involves increasing their per capita income, there is some correlation between more income and less children. It’s going to be extremely difficult to pull 5+ billion people up to our standard of living without them pulling some of the weight. Education programs have been tried with some good results, but large programs have also shown themselves to be open to fraudulent grading to game the system. Decentralized and cheaper education may help this trend somewhat. Keep running with the decentralized/cheaper/free education trend. Education costs a lot, and it’s return on investment seems to be falling while it’s cost has been rising. It also somewhat inefficient, and therefore eats up extra early productive years. It acts as a safe haven where people can be sheltered from real life while appearing productive. Right now families have a hard time getting enough money together to raise a family. I am hesitant to suggest a government program for (smaller) young families, but in this political/economic climate it might be the only way of getting it to work. Most women put off having a family so that they can climb corporate/government ladders into a large corporate/government job. This is partially because these large structures must comply with affirmative action/discrimination laws. They usually end up in bureaucratic middle-management/support jobs, the types of training they get skew heavily towards these occupations. They tend to favor Public Administration, Education, Psychology and Health Services over STEM. 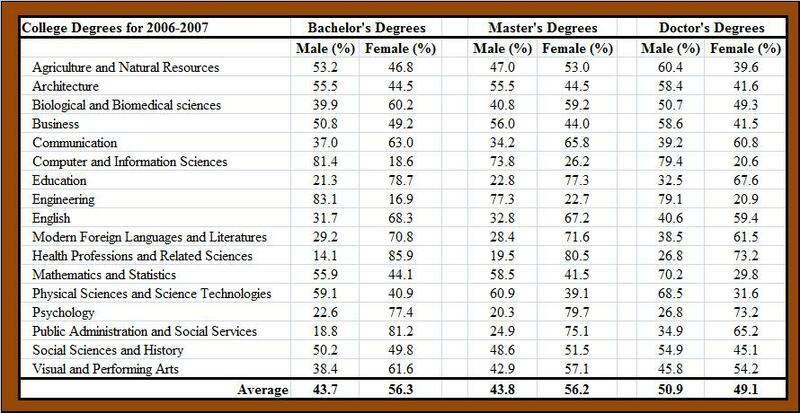 The business degrees hasn’t changed their representation in the business world very much, many of those degrees are closer to secretarial/assistant positions. If the economy dips into a deeper depression, it’s likely that many of these non-essential rolls that women fill will be cut. Employment is becoming much harder to hold on to, most jobs are being redefined so much that it’s very concept is mercurial. Men tend to be better at working with a large, shallow network of relations, whereas women work good with smaller, more intensive ones. If the trend towards technological decentralization and economic virtualization continues apace, women will likely find themselves working in smaller groups. This may provide them with a more stable, meaningful support network for raising children. The economic depression, if it occurs, will provide many meaningful challenges that women in our culture have thus far lacked. It may be a good time to get rid of the dysfunctional attitudes of political correctness and start building a value system that works.